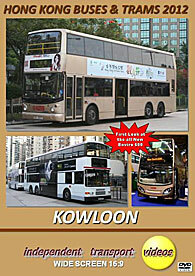 Our return visit to Kowloon in 2012 reveals a number of changes since the independent transport videos cameras made their last film in the area in 2010. Gone are the non-air con Dennis Dragons and Leyland/Volvo Olympians of KMB once a familiar sight on the mainland in their smart cream and red livery. However there is still plenty of interest for the bus enthusiast from the three main operators in the area, KMB, Citybus and New World First Bus. There are plenty of Wrights bodied Volvos, new two axle Enviro 400s for KMB and brand new Enviro 500s for Citybus which you will see on this programme on their first day in service! Our filming starts in the western part of Kowloon at the very busy Mei Foo bus station and adjoining roads. There is plenty of action with many of the ‘white’ air-con Scania, Volvo Olympians and Dennis Dragons in both 11 and 12 metre versions, new Scania single and double deckers as well as the familiar ALX500 double deckers – and that is just from KMB! Citybus presents brand new Enviro 500s, just hours into their busy lives in this vibrant part of Asia. Filming completed, we board KMB Scania N113 with Alexander bodywork, AS13 (GW 2410) on route 2A for a ride to Nathan Road at Mong Kok. AS13, which is soon to be retired provides an interesting ride along the busy streets to our next location. Nathan Road is probably the busiest road in Kowloon for buses, so we film at various points along this road for you get the best views of all the action. From the southern end of this road we enter Salisbury Street on our way to Tsim Sha Tsui bus station at the Star Ferry pier. From this old traditional bus station we head to the new Jordan Bus Station on To Wah Road. This bus station has moved here in recent years due to redevelopment of the old site which we show briefly at the end of the scene. Our next filming location is Hung Hom bus station and Hong Chong Road, Hung Hom. Again all three companies are seen here at this busy location near the Cross Harbour Tunnel entrance. Our final scenes on this visit are filmed at the eastern end of Kowloon at Kwun Tong, mostly around the busy ferry pier bus station as the buses run in from the early morning rush. Many KMB vehicle types are seen, but with a high proportion of the older white liveried Dragons and Olympians - a fitting end for our visit to Kowloon. To complete this programme we present a bonus feature of the all new Alexander Dennis Enviro 500 for KMB at it’s launch at the Euro Bus Expo 2012 exhibition at the NEC, Birmingham, UK on the 6th November 2012. It really is the shape of things to come! Duration : 85 minutes (approx).